View video of WinADay progressive jackpot games. 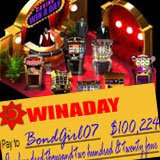 One lucky online slot machine player is glad she took her friend’s advice and tried the free games at WinADay.com. She ended up winning a progressive jackpot of over $100K and became the third big jackpot winner at the new three-dimensional online casino site operated by Slotland.com.